Are Automatic or Manual Sanitary Bins Better? Home » Blog » Are Automatic or Manual Sanitary Bins Better? Are Automatic or Manual Sanitary bins better? In the end it comes down to a multitude of factors that determine this. Both manual and automatic sanitary disposal units have their place in the hygiene industry. Obviously Manual bins have been around for decades, and are a proven hygienic and safe way to dispose of feminine sanitary products. However, Automatic sanitary bins are an innovative way to reduce cross contamination by utilizing a no touch, hands free way to dispose of feminine products. In this helpful blog, I will examine both the upsides and downsides of automatic AND manual sanitary disposal units. In terms of which product has the advantage, you can’t really go wrong with a manual sanitary bin. Although it doesn’t feature the ‘hands-free’ technology of its automatic counterparts, you are guaranteed to be able to use it at all times. If the automatic bin’s battery, or motor fails at some point in-between scheduled services, the bin potentially might not be able to be opened! This will lead to feminine products either being dumped on the floor, or in the toilet bowl, which in-turn may lead to expensive call-outs to fix the broken or damaged sanitary unit. Another downside related to Automatic Sanitary Bins is that they incur a higher cost due it being battery powered, as well as batteries not being environmentally friendly. In places of high traffic and use, the automatic sanitary bins might require constant monitoring to ensure that the batteries are not failing. Some of the pros of Automatic touch free sanitary bins is that no one ever has to touch the lid! This is a huge upside compared to a manual bin that is touched by the user at every use! 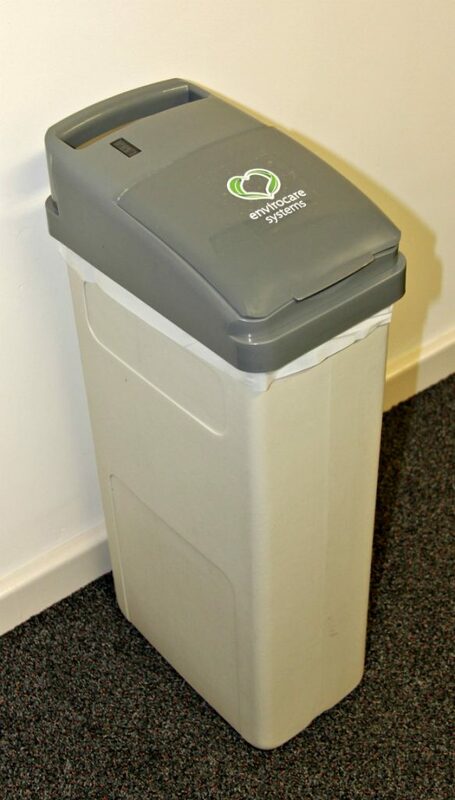 In high traffic areas an automatic bin may superior in the fact that a manual bin could be touched hundreds of a times a week, and there is no way to make sure people who are using the bin are hygienic or free from bacteria. Many patrons might feel safer using an automatic bin in a high traffic area and this would lead to less patrons utilizing the toilet bowl as a way to dispose of feminine hygiene products. As mentioned earlier, both Manual and Automatic sanitary disposal units are proven ways to reduce cross contamination in female washrooms, by offering a safe and hygienic way to dispose of female hygiene products such as pads, or tampons, However we believe that manual sanitary bins are ever-reliable and always hygienic. For your peace of mind at Envirocare Systems we offer both Automatic and Manual Sanitary bins as part of a flexible service schedule. Our slim profile sanitary disposal units are ALWAYS serviced off-site to ensure all waste is disposed safely and hygienically, ensuring neither you nor your customers are exposed to dangerous waste. Call us today or fill out an enquiry form for a hassle free site survey done by one of our professional hygiene experts to find out what works for you.